A shared reading resource to compliment Dr. Jean's Chant and Write Numbers song. Print, laminate, bind, and use with Dr. Jean's CD or download. A simple strategy that promotes critical thought, engagement, and idea fluency. Graphic organizers to support reading comprehension with a seasonal flair! A fun game to work out your subtraction fact skills! 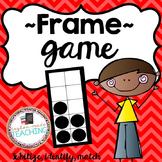 This easy-to-prepare game makes a great center, homework activity, or small group lesson. Ask Taylor-Made Teaching a question. They will receive an automated email and will return to answer you as soon as possible. Please Login to ask your question. Kids should work harder than adults!